What does hope mean to a person who was expelled from their home by ISIS? How do you gain trust in a fractured community? What does interfaith reconciliation look like in Iraq in 2019? Many in the Nineveh Plains of Iraq have asked these questions. And one of the forces hoping to make sure the right answers exist is Monsignor Najib Mikhael Moussa, according to a March 1, 2019, article by Caritas. In January, Moussa became the new archbishop of Mosul. This is significant because he is the first bishop installed in Mosul since Christians were expelled from the city by ISIS in 2014. Moussa, born in Mosul, helped assist displaced people from the city and the Nineveh Plains during years of occupation by ISIS. Thanks to his training as an archivist, he could preserve part of Mosul’s Christian and non-Christian cultural heritage that extremists wanted to destroy. During his inauguration, Moussa issued a message of “coexistence, love, and peace”. For many, his appointment is a blessing of hope. Because of their commitment to the community, Caritas Iraq and Catholic Relief Services (CRS is a US Caritas) were asked to participate in the ceremony for the bishop. A traditional part of the Iraqi Episcopal installation is a symbolic distribution of food to the poor by the new bishop. Given the significance of the event, the current humanitarian crisis and interfaith tensions in the area, the distribution was unusually large. “Caritas Iraq helped poor mostly Muslim families who had suffered under ISIS. This activity was implemented by the staff of Caritas Iraq and its volunteers supported by the CRS. 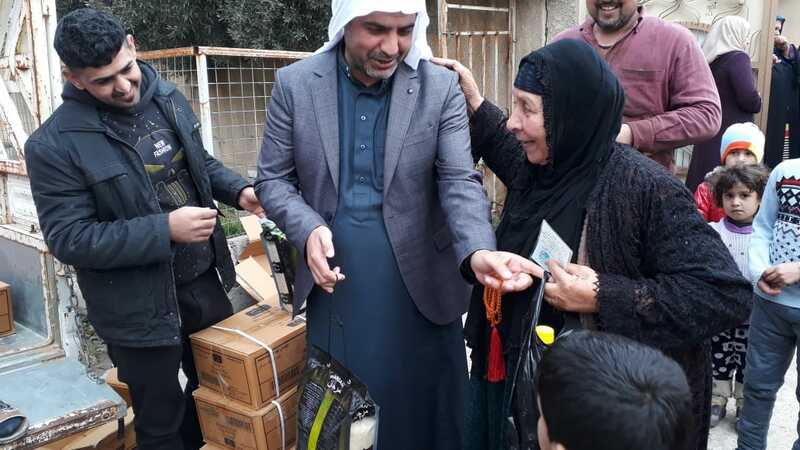 More than 1000 poor families received selected food items,” said Nabil Nissan, Caritas Iraq director. Hani recently spoke to Moussa and says he is encouraged by the bishop’s vision of restoring peace and building trust. Nearly 2 million people remain displaced across Iraq, while 4 million people had returned to their homes. Caritas in Iraq works on livelihoods, health, clean water, cash for work, shelter, rehabilitation of basic infrastructure, psychosocial support, child protection, education, and peace-building. The focus is increasingly shifting towards the long-term needs of those affected by the conflict. In addition to Caritas Iraq, CRS, Cordaid, and Caritas Czech are currently operational in the country. Most Caritas programmes are in northern Iraq, specifically in Nineveh and Duhok, and in Baghdad. In 2018, the Catholic Church including Caritas mobilized around $230 million and reached 3.9 million people.